Honda’s GX Series V-twins are built for high demand applications including everything from generators to UTVs, delivering power with the company’s signature reliability and ease of operation. No matter what your GX powers, there are a few things you should do to get the most out of your engine. Don’t see a throttle or a choke lever? Some equipment mounts the throttle remotely, typically placing it on a handle. This is almost guaranteed with vertical shaft models. The choke is engaged by pulling the choke knob out. The hour meter will display the current operation hours when the ignition switch is on, but it only counts time when the engine is running. These engines have a fuel cut solenoid that lets fuel enter the carburetor when the ignition switch is in the “On” and “Start” positions, and then closes the fuel line when the switch is off. If the battery becomes disconnected, the solenoid will close the fuel line, causing the engine to stall. Some models also have a separate fuel valve on the fuel tank that needs to be opened when the engine will be used, then closed when it is put away. Honda’s Oil Alert system will shut down the engine if the oil level inside the crankcase gets too low, preventing potential engine damage. If the system is tripped, the indicator light will turn on. If the engine stops suddenly, check both the light and the oil level. The throttle should be about 1/3 of the way from the lowest “Min.” position, and the choke should be closed unless the motor is being restarted. If there is a fuel valve on the tank, make sure it’s open. To turn over the motor, turn the ignition switch to “On,” then twist it to “Start” until the engine fires up. If the engine isn’t running after 5 seconds, release the ignition switch and wait 10 seconds to let the starter motor cool off before trying again. Once the engine is running, it should idle for a couple minutes to let it warm up. Move the throttle to the “Min.” position, then turn the ignition to “Off.” If equipped, close the fuel valve. On horizontal shaft engines, the oil is poured into a filler neck located at the top of the right side cylinder head. The oil can be checked using the automotive-style dipstick behind this cylinder. On vertical shaft models, there will be a combination filler neck cap and dipstick behind the right-hand cylinder. The oil level should be checked after the engine has idled for a couple minutes and is then shut off. The level should be between the two marks on the dipstick. On vertical shaft models, the cap should not be threaded into the filler neck when using the dipstick to check the oil level. GX Series engines are designed to use 5W30 or 10W30 oil in most operating conditions. If you need to operate the motor at temperatures below 10 degrees F (-15 degrees C) a synthetic 5W30 is recommended. SAE 30 can be used at temperatures above 50 degrees F (10 degrees C). Oil can be drained by removing a plug bolt at the base of the engine. The GX series also uses a spin-on oil filter, which should be replaced each time the oil is changed. The air cleaner is behind a latched cover between the cylinders. Vertical shaft motors use a series of panels, while horizontal shaft motors use round filter elements. The air cleaner uses both a paper element and a foam element. The foam element should be cleaned by washing it with a mild detergent or a non-flammable solvent. Once dry, soak it in clean engine oil and squeeze out any excess. The paper element should be tapped against a hard surface to loosen any dirt between the pleats. The spark plug gap should be between 0.028-0.031 inches (0.7-0.8 mm.) The plugs can be removed and installed using a 5/8 inch plug wrench or socket. When installing, screw the plug into the engine by hand to ensure it doesn’t cross thread, then tighten it down 1/8-1/4 turn after it seats if it’s used, or ½ turn if it is new. Need something for your Honda GX V-twin? You can get it from www.hondalawnparts.com. 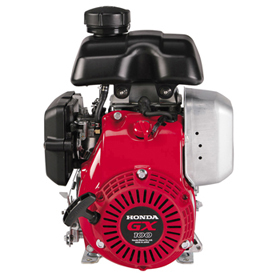 We’re a certified Honda Small Engine Equipment dealer, so we carry everything for their motors. When you search for parts on our site, you’ll see factory parts diagrams and descriptions so you can quickly find what you need. We ship parts across the U.S. and Canada. 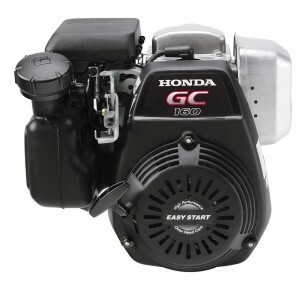 The GC Series may be aimed at residential use, but it’s just as reliable as anything from Honda. Found mostly in pressure washers, tillers and water pumps, this motor is easy to use if you know how to operate and take care of it. What’s the Difference between the GC160 and GC190? Both engines are identical aside from the GC190’s longer stroke and higher weight. The information below applies to both versions of the GC series. There are three versions of these motors, each with their own control set located to the right of the fuel filler neck. All models have a choke rod which has a hook on the end. Pulling this rod out closes the choke. Next to the choke rod, there may be a lever. If the lever is gray, it’s the throttle lever. Pushing it up will open the throttle, increasing engine speed. If it’s red, it’s the ignition switch. Pushing it up switches the ignition on, allowing the motor to run. Some fixed throttle engines have an engine stop/start switch next to the choke rod. Turning the knob clockwise switches the ignition on, while turning it counter-clockwise cuts the ignition, shutting off the engine. Before starting, the choke should be closed if the engine is cold and open if the engine is warm. If your motor has a throttle, it should be set to 1/3 of the way toward the “Fast” position. If it has an ignition switch or stop/start switch, it should be on. Use the recoil starter to turn over the engine. Once the engine is warm, the choke can be opened and the throttle set to the desired speed. To stop the engine, shut off the ignition or push the throttle lever all the way down to the “stop” position. These engines are designed to run regular unleaded fuel with up to 10% ethanol. The fuel tank should be filled no higher than the bottom of the filler neck. When storing the engine, keeping the fuel tank full will limit the air inside. This reduces oxidation and aging. If the fuel will be stored for more than a month, a fuel stabilizer should be used, but this will only extend the fuel’s life to a maximum of three months. If your engine isn’t running well due to stale fuel, use a siphon hose to remove fuel from the tank, then get the last of the gas out by loosening the drain screw on the base of the carburetor. If you operate your engine at elevations above 5,000 feet (1,500 meters,) Honda recommends having the carburetor re-tuned to deliver the right amount of fuel to match the lower density air. Honda recommends checking the oil level before each use. The dipstick is attached to the oil filler cap, which is located directly below the muffler. To get an accurate reading, the dipstick must be inserted without screwing the cap back into the filler neck. This motor is designed to use 5W30 or 10W30 oil with an API certification of SJ or greater. SAE 30 can also be used at temperatures above 50 degrees F (10 degrees C.) When filling, the oil should come up to the bottom edge of the filler neck. Oil can be drained from the motor by removing the drain bolt and washer, located to the left of the filler neck. This motor holds about 20 oz. of oil, and it should be changed every 6 months or 50 hours of use. If you use the engine in high temperatures or places with a lot of dust, Honda recommends changing the oil every 25 hours. All GC engines come equipped with the Oil Alert system. If the sensor inside the crankcase detects that the oil level is below a safe level, it will shut the engine off automatically. If the engine stops working, check the oil level to make sure this system hasn’t been tripped. The air cleaner housing is located directly above the fuel tank. The paper filter inside can be accessed by opening two clasps on the side of the cleaner cover. The filter should be inspected for damage before each use. It should be cleaned every three months or 25 hours by gently tapping it against a hard surface to remove loose dirt. The filter needs to be changed every two years or 250 hours. When you need parts for your Honda motor or equipment, visit www.hondalawnparts.com. We’re a certified dealer, so we’re able to offer OEM replacements for everything from Honda’s small engine equipment line. Our site has factory diagrams and descriptions built-in, making it easy to find exactly what you need, and we can ship your order to any address in the U.S. and Canada. The horizontal shaft Honda GS can be found in a wide range of residential lawn and garden equipment as well as commercial equipment that puts a premium on low weight. No matter what your GS engine is powering, there are a few things you should know about it to get the most out of your motor. A gray manual throttle lever – Moving the lever up opens the throttle, increasing engine speed. A red ignition switch lever – Moving the lever up will enable the ignition. Pushing it down will stop the engine. An engine stop switch – Turning it to the right enables the ignition. Turning it to the left will stop the engine. Some versions of the GS come with Honda’s Oil Alert system. It uses a float inside the crankcase to detect low oil levels. If the level is too low, it will shut off the engine to prevent damage. If the engine stops suddenly without any clear external cause, check to make sure the oil level is correct. The oil drain bolt is located on the bottom edge of the engine, directly below the muffler. The dipstick is part of the cap on the filler neck, located to the right of the drain plug. To check the oil level, the dipstick must be inserted into the filler neck without screwing it down. Honda recommends using 5W30 or 10W30 oil for most operating temperatures, or SAE 30 for temperatures above 50 degrees F (10 degrees C.) When changing the oil, the fresh oil should come up to the top of the filler neck. It should take about 20 ounces (0.58 liters) of oil to fill the crankcase. Engine oil should be changed after the first month or 5 hours of use, then every 6 months or 50 hours thereafter. If the engine is used under heavy load or high temperatures, change the oil every 25 hours. The air cleaner box, located above the fuel tank, can be opened by pressing in two tabs on the side of the cover. Below this, there’s a foam filter, a plastic grid, and a paper filter. Wash the foam element in a mild detergent or clean it with a nonflammable solvent, then soak it in clean motor oil once it has dried. Squeeze out any excess oil before installing. Remove dirt from the paper element by tapping it against a hard surface. The air filter should be replaced every two years or 200 hours of operation. The spark plug should be gapped between 0.028-0.030 inches (0.70-0.80 mm.) It should be checked every 6 months or 50 hours of operation and replaced every two years or 200 hours of operation. The arrester is a metal sleeve that fits inside the exit of the muffler and can be added to any GS series motor to meet local safety requirements. To access it for cleaning, take off the muffler protector by removing three bolts around the outside edges. The arrester itself can be removed by removing a single screw. Use a wire brush to remove any deposits, and replace the arrester if it shows signs of damage. The fuel tank is designed to hold fuel up to the bottom of the filler neck. This engine is designed to run on gasoline with no more than 10% ethanol (E10.) A stabilizer should be used if the fuel will be stored more than 30 days, and even stabilized fuel should be replaced after 90 days. If you need to drain the fuel system for storage or to remove stale fuel, use the drain on the carburetor, located directly below the air filter. It has a place to attach a hose which can be inserted into a fuel tank to capture the exiting fuel. Use a flathead screwdriver to open the valve directly above the drain to let the fuel flow out. If you’re storing the engine, start the motor and let it run until it dies to ensure the fuel system is completely empty. Honda recommends having the carburetor jets changed if you use your GS motor at altitudes above 5,000 feet (1,500 meters) to better match fuel delivery with the available air. If you have an engine with an automatic throttle, the throttle mechanism may need to be adjusted if the motor doesn’t want to slow down once the load has been removed, or it takes a while to return to speed once the load has been reapplied. www.hondalawnparts.com is a certified Honda Engines dealer offering everything you need to maintain and repair your GS Series motor. Our site has factory exploded parts diagrams built in to help you find the parts you want to order, and we can ship those parts across the U.S. and Canada. 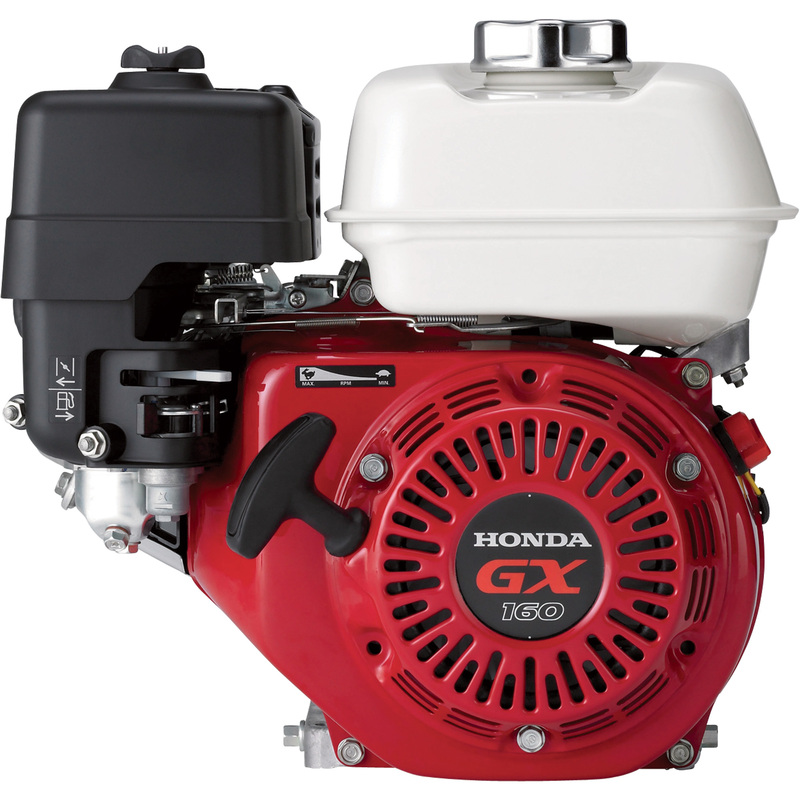 Chances are if you own any commercial-grade small engine equipment, you have at least one Honda GX Series engine. Available in horizontal and vertical shaft versions and displacements ranging from 98 to 389 cc, this series of motors can be found in just about any type of small engine equipment you can think of. Here’s what you need to know about this motor’s quirks, from starting to troubleshooting. There are many variations on these models and individual pieces of equipment may leave controls on the engine or move them to a remote control center, typically on the device’s handle. The main controls are located on the carburetor, which will be directly below the air cleaner housing. Some models will have a throttle lever at the very top, almost against the air cleaner housing. Next, on the carburetor body itself, there will be a choke lever. Below that, some models have a fuel valve. For starting, the throttle should be set to 1/3 of the way from “Slow.” On models with the lever on the engine, move the lever left to open the throttle. The choke should be closed unless the engine is already warm, and the fuel valve should be open. On electric start models, the engine is started by turning the key or switch to “Start.” After 5 seconds, if the engine hasn’t started, release the switch and wait 10 seconds to let the starter motor cool before trying again. If the engine won’t start, set the switch to “On” and use the recoil starter. The dipstick is built into the oil filler cap. To check the oil level correctly, the dipstick needs to be wiped off and then inserted into the engine without threading it back into the filler neck. When adding oil, the oil level should come to the edge of the filler neck. Some models are equipped with Honda’s Oil Alert system. This will automatically shut off the engine if the oil level gets too low. If your motor stops abruptly, check the oil level to make sure this wasn’t the cause. On electric start models, there should be a light on the starter panel indicating the oil alert system has been triggered. On motors with a reduction gear, the gear is in a separate case with its own oil supply. It has its own filler cap/dipstick and uses the same oil as the engine. The case should only be about half full of oil, which will be well below the top of the filler neck. No matter the model, the muffler on your engine is designed to be used with a spark arrester where required by law. The arrester can be accessed by removing the muffler shield. The arrester itself will be held in the muffler by one screw. To clean the arrester, scrub off any deposits with a wire brush. If it has any splits or holes, it should be replaced. Paper elements can be cleaned by knocking them against a hard surface to loosen dirt. Foam elements should be washed with a mild detergent or non-flammable solvent. Once dry, dip the filter in clean motor oil and squeeze out any excess liquid. Cyclones should be disassembled and wiped clean. Any dust inside the cleaner housing should also be wiped out before reassembly. If you have an LPG-powered version of the GX270 or GX390, there are a couple differences in operation. Since LPG is a gas, there won’t be any visual signs of leaks. Instead, smell the area around the engine. If you detect any trace of LPG, have the fuel system repaired before starting the motor. The choke lever increases vacuum to help pull gas into the combustion chamber. Once the engine is running, the engine will provide the necessary vacuum, and the choke can be opened. There’s no need to wait for the engine to warm up. Use only SAE 30 weight oil designed for use with LPG engines, or a synthetic 5W-30 oil if using the engine below 32 degrees F (0 degrees C.) A mineral-based multi-weight oil may be fine in other GX motors, but it will damage your LPG model. No matter what your Honda engine is connected to, you can get parts for it at www.hondalawnparts.com. 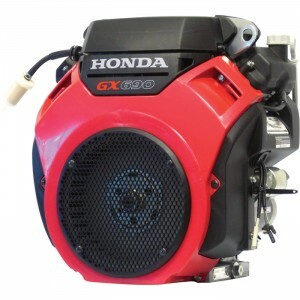 We’re a certified dealer, covering both small engines and Honda power equipment including generators, water pumps, and mowers. Our advanced search engine can show you factory parts diagrams so you can see exactly what you’re ordering. We ship to both the U.S. and Canada.